TAMPA, Fla. – The United Soccer League (USL) announced today the expansion of its broadcast agreement with ESPN for the 2018 and 2019 seasons that will bring more regular-season games to linear networks and make ESPN+ the league’s streaming subscription service in the United States. Now in its third season, the USL’s agreement with ESPN will see six USL regular season games and the 2018 USL Cup aired on linear networks, a major increase from a season ago. The full 2018 Game of the Week schedule will be released in the coming weeks. In addition to the USL Game of the Week on ESPN3, the league’s regular-season contests will be available in the United States through ESPN+ after its launch on April 12, where the league will reside alongside Major League Soccer, the English Football League and UEFA Nations League on the new direct-to-consumer subscription streaming service from The Walt Disney Company Direct-to-Consumer and International group in partnership with ESPN. Prior to the launch of ESPN+ on April 12, all USL regular season contests will be available through the league’s YouTube channel. Games will be produced by USL Productions, the league’s state-of-the-art broadcast production, broadcast and distribution facilities with VISTA Worldlink in south Florida. Now in its second season, USL Productions produces and distributes more than 500 league matches and more than 1,000 hours of original content to national partners and local affiliates. The USL Match Center will also return for the 2018 season, with up-to-the-minute match statistics provided by industry leader Opta. The USL is one of the most prominent professional soccer leagues in North America, reaching a population of more than 75 million people to fuel the growth of professional soccer across North America. Headquartered in Tampa, Florida., the USL provides unparalleled club support with a growing team of more than 50 professionals across 17 departments, ranging from operations to marketing, communications and sponsorship. 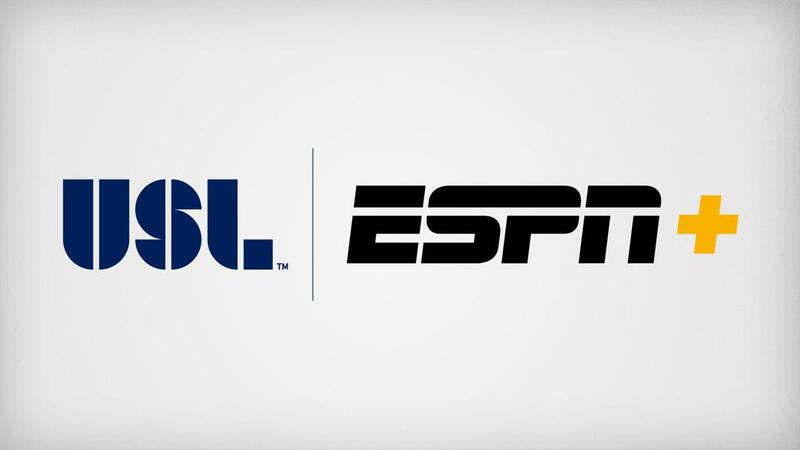 The USL has national media partnerships with ESPN and operates USL Productions, which includes a state-of-the-art facility that will produce and distribute more than 500 league matches and more than 1,000 hours of original content to national partners, local affiliates, the USL’s Match Center and international markets over the 2018 season. ESPN+ will be the first-ever multi-sport, direct-to-consumer subscription streaming service from The Walt Disney Company Direct-to-Consumer and International group in partnership with ESPN. It will offer fans thousands of additional live events, on-demand content and original programming not available on ESPN’s linear TV or digital networks. This includes hundreds of MLB, NHL and MLS games, Grand Slam tennis, Top Rank boxing, PGA Tour golf, college sports, international rugby, cricket, the full library of ESPN Films (including 30 for 30) and more. Fans can subscribe to ESPN+ for just $4.99 a month (or $49.99 per year) and cancel at any time.